Crafting With Passion: A huge photo frame!! Wish u all a very happy and prosperous New Year 2015!! I have taken a red corrugated sheet for the base. The pretty yellow daisies are from TH tattered florals, i have done the centre with small brown crystals. See this pretty wood veneer... loved it to bits. I bought it from Shailey Agarwal, Chennai. I had been waiting for a project to use it and this one seemed right. Just adorned it with small pretty flowers and leaves. Here is the base i made, i used wooden cardboard used for packaging, and the stands are made from cardboards too. Gave it a finished look using washis and varnish. I also made a box to go along with it, PP, laces, washis and ribbons for it. I loved how it turned out. Thats it for today. Hope you all liked it. Thanks for dropping by. Have a great year ahead. it is so beautiful suja. 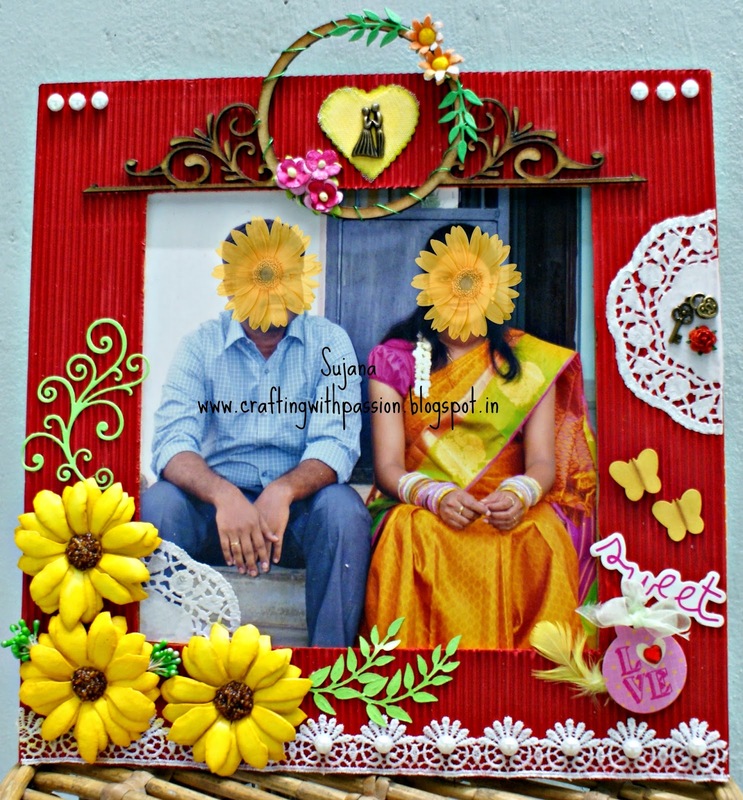 What a beautiful frame Sujana ..I so love the way you have embellished it ..and the fact that you have completely made it from scratch is so impressive ..its such a well finished project I am sure your client must have love it !! Sujana, this is so impressive, love the wood veneer piece and all other pretty embellishments , the box is gorgeous !! I love to see corrugated paper on crafts...so few people use it. You have made a super stylish frame..Especially the stand!! Sujana the frame is very beautiful n me too loved the wood vineer and the stand behind ....all colors are going very well. Beautifully embellished frame Sujana...and box is so cute..
Oh my. What a fabulous and practical use of cardboard. How clever! This is soooo attractive - you are very clever making the WHOLE lot from scratch.....& the box as well! AMAZING....& I see why you fell in love with that wooden scroll element. A GORGEOUS project - so glad you joined us at LESSology this month!!! So bright and beautiful, definitely going to add color to your clients room and to be cherished too. I have that tattered flower die myself and never thought to pair that shape with others of the same. SUPER COOL IDEA and I think I need to dig it out and give it a try! Really love piece, the colors are spectacular! Thanks for playing with us at LESSology!